Within days, up pops another example of contentious tree felling on heathland and, as I predicted with no great relish (see Swineholes Wood – ‘too many trees being cut down’) this one comes as a result of the pressures created by the priorities in the UK Biodiversity Action Plan (UKBAP) rather than has often been the case so far, as a result of SSSI designation. For the local people around Loxley and Wadsley Commons, this area is a unique and cherished space, the original 75 acres given into public ownership in 1913 to be held in trust “for the perpetual use and enjoyment of the public”. What is not unique is that the original intent of the land has become subverted recently by the overlaying of what seems to be dogmatic conservation interests. In this respect it has many parallels with the events at Blacka Moor, another publicly owned space on the margins of Sheffield, given in 1933 and held in trust for “health-giving exercise and pleasure” (see Blacka Moor in peril from the conservation professionals). At Blacka Moor, the contested conservation work, including tree felling, is a result of what I believe is an unwarranted SSSI designation (see Four strands of barbed wire - a Blacka Moor update). And there are parallels with Ashdown Forest in E Sussex, bought by public subscription in 1988 and held in trust “for the benefit of the public”. The aim of the Trust isn’t even a consideration in the draft Forest Plan drawn up for the Board of Conservators, who only see the Forest in terms of its SSSI, SAC and SPA designations (see Swineholes Wood – ‘too many trees being cut down’). Why is this strife also happening at Loxley and Wadsley Commons? As we have seen with Ashdown Forest, local authorities were quick to cash in on farming subsidies if it meant they could get some funds to cover land management. Thus Loxley and Wadsley Commons were entered into a Countryside Stewardship Agreement (CSA) in 1992 by Sheffield City Council (Sheffield CC) for the management of lowland heath. This would have been the first 10-year plan for management, and it is likely that the management effort would have been concentrated mainly on preventing encroachment of woodland into the two areas of registered open space that take up less than one third of Loxley and Wadsley Commons, one of which is registered common land, with neither being grazed in recent memory. Loxley Common, despite its name, is not registered as open space or as common land. There is an assertion on the Sheffield CC website that Loxley and Wadsley Commons are designated an SSSI (4). This is incorrect. However, in 1999, Sheffield CC declared Loxley and Wadsley Commons a Local Nature Reserve (LNR). This is a voluntary declaration, lodged with English Nature, the requirements of the latter being that the local authority own, lease or have management agreements over the whole area of the reserve (5). The entry for the LNR on the Natural England (as it is now) website gives little information other than its area at 52.37Ha, and a map showing the boundary (6). Thus there is no statutory condition monitoring by Natural England of the LNR as there is no characterisation of the habitat features as there would be for a SSSI. Given that this information is readily available in the public domain, it is surprising how many advocates for the destructive management at Loxley and Wadsley Commons that I have come across seem to invoke some pseudo SSSI status or even a pseudo SAC or SPA status (European designations) to defend it. The Area Action Plan noted that a steering committee had been set up in 2002/3 to develop a new management plan for the site, and I have this plan before me as being the root cause of the conflict at Loxley and Wadsley Commons (8). This has to be one of the more ideologically dogmatic reads that I have had for some time - or at least since I last read a heathland/moorland management plan such as the ones for Ashdown Forest and for Blacka Moor. It has no feel for the "genius loci" or wild aesthetic of Loxley and Wadsley Commons, which it must have if it is proposing such a considerable acceleration of management intervention by the felling of 2,800 trees in a publicly owned and used space. The management plan shows every sign of being the product of a perfunctory process that ticks boxes by picking off-the-shelf prescriptions from the conservation professional’s handbook. Would it be anything different since the main authors were respectively a Forest Ranger in PWCS and an ecologist with the Sheffield Ecology Unit, the latter drawing up the management options after the initial public meeting, but which were never subsequently publicly consulted upon? "At the moment the rangers are digging up trees by their roots and making a terrible mess of it"
As old oak trees decline, they appear to become “stag-headed” as their branch structure dwindles and they do provide more niches for insects, fungi and bird life than younger trees. But the best way to develop veteran characteristics in oaks is to LET THEM GROW OLD. Does this ring true with the guidance on LNRs given by Natural England that I quoted earlier? Is there any obligation on Sheffield CC that forces them to restore and preserve every last handkerchief patch of heath on Loxley and Wadsley Commons? 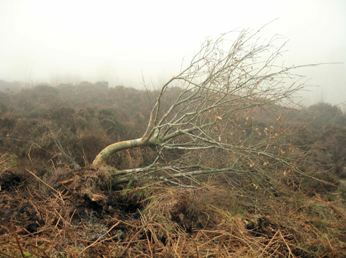 The management plan references lowland heath as nationally scarce so that it is a priority habitat in the UKBAP, which is translated into the Sheffield area by a Local BAP (LBAP). The LBAP does have a Habitat Action Plan (HAP) for Lowland and Upland Heath (10) but, surprisingly, the HAP notes that in the Sheffield LBAP area most of the heathland is intermediate, with little lowland heath and no upland heath. Intermediate heath occurs between upland and lowland heath at about 300m, the top end of the range for lowland heath, and has a mix of characteristic species from both lowland and upland heath (these could be H10-H16 – see the heath communities of the National Vegetation Classification in 11). The HAP implies that the heath at Loxley and Wadsley Commons is intermediate, the description of heath in the North Area Action Plan for Loxley and Wadsley Commons has it as intermediate (see earlier), and the Forestry Commission in questioning by the Friends over the felling licence for the LNR consider it as intermediate as well. So why does the management plan call it lowland heath? How can you justify a management aim based on scarcity of lowland heath, when the heath in question is intermediate? Having been involved in an LBAP process, I can't see that they are anything other than voluntary in the sense that the plans arise out of local deliberation and choice, except that the choice is often left to the conservation professionals. As I have argued above, the pressure on the heaths in the Sheffield District to be conserved arising from the heathland HAP of the Sheffield LBAP is misguided because it does not distinguish whether intermediate heath is scarce, and while it says that lowland heath does exist at some locations in the Sheffield LBAP area, it does not differentiate between intermediate and lowland heath in the targets and actions, nor identify precisely where the lowland heath is located. All these arguments are just balancing on the head of a pin when you consider that the management plan has a major failing that in my opinion should invalidate it as a credible document. It omits to identify that a part of the LNR is covered by ancient woodland. I doubt that the authors of the plan were ignorant of this since all local authorities are required to keep a register of ancient woodland in their area and protect it from development (PPS 9 – see 13); there is guidance for local authorities on what ancient woodland is, its importance particularly in nature conservation terms, and how it is identified (14); and there are also three online mapping systems that can reveal the location and shape of ancient woodland (15, 16, 17). Whether the omission was disingenuous or not, it is consistent with the prejudice of many conservation professionals who just don’t think of trees as wildlife too, and for reasons best known to themselves, have little understanding or feel for the remarkable ecology of ancient woodland. Moreover, there is a HAP for Ancient Woodland in the Sheffield LBAP (18) and so the management plan for Loxley and Wadsley Commons could just have easily reflected the targets and actions in that HAP as well. Thus instead of considering the naturally regenerated birch and oak woodland as disposable in the cause of heath and butterflies, the management plan could instead have reflected that the soil and ground layer of ancient woodland is, in terms of replacement value, infinitely more important than heath and butterflies. This is recognised in the HAP for ancient woodland because its targets seek to allow existing ancient woodland to expand, and for fragments of ancient woodland to join up. Thus the ground layer in the woodland that is contiguous with the ancient woodland has the potential to develop eventually very valuable ancient woodland characteristics if the tree cover is left undisturbed, as well as the ground layer itself is undisturbed. Given this information, the management actions in the plan for this area of woodland should have been resisted, particularly since the felling licence, as shown by the Land Information Search mapping of the Forestry Commission (17) does not cover this area of the woodland. now opened up a whole area - it really is sad"
And this contiguous woodland is real woodland, and not some invasive weed infested patch as implied in the management plan - “most of the trees are less than 30 years old” - since it is shown as woodland on the mapping of the National Inventory of Woodland and Trees, as is the woodland covering some of the small areas of remnant heath that is scheduled for tree clearance (15). Thirty year old woodland is 30 years closer in forming new, valuable woodland next to the ancient woodland that may take a century and more to mature into ancient characteristics rather than the 10 years of the management plan. Is it too much to ask of the management plan authors, its supporters or even the PWCS Rangers to have made a contribution to an objective in the HAP for ancient woodland that says “Raise public awareness of the importance of ancient woodland”? As is becoming clear around the country, the short term interests of conservation professionals, as translated into their management plans, is failing what could be the longer term vision of what local people want to see for their publicly owned land. Even when there is a public consultation process, as at Blacka Moor and Ashdown Forest, local people come away feeling that their views are dismissed because all they have is the opportunity to comment on management prescriptions rather than talk about the unique and natural genius of the place. What is important about places like Loxley and Wadsley Commons, Ashdown Forest and Blacka Moor is that with extractive land use removed, ecosystem restoration begins so that they are places in transition as natural processes return, that the changes are fascinating and incredibly rewarding, whereas so much of conservation is about strangling land in a prescribed stasis. - even after the 1 March curfew for dog walkers"
What is also becoming clear is that the sheer impact of conservation work, and its recent acceleration in many places, is immensely damaging and disfiguring, and seemingly lacking in empathy with the natural systems it seeks to manipulate. Rarely is this impact assessed before work goes ahead, but surely it should be when it causes such dismay at its assumptions and often crude high handedness? There are regulations that can enforce such an assessment of impact, and I came across one heathland restoration project proposed recently where the sheer scale of the work has meant that it has had to comply with the Environmental Impact Assessment (Forestry) Regulations 1999 (19). Last year, the RSPB bought 180ha or so at Broadwater Warren, south of Tunbridge Wells, that consists of conifer plantation, heathland and ancient woodland (20). Their plan to restore more heathland there by clear felling a total of 82ha of plantation conifer obviously requires a felling licence. However, the scale of the work - carried out over only six years in the proposal - indicated that it would have significant environmental impact (21). Thus before that felling license can be given there has to be consent for the work from the Forestry Commission after an Environmental Statement (ES) in support of the proposals is submitted (22). You can imagine the scene of devastation afterwards in the cleared plantation if the RSPB gets that consent. They will be keeping their fingers crossed that these areas will eventually be colonized by heath from the scraps of heather that exist on the sunny sides of tracks in the plantation. In this Environmental Impact Assessment (EIA) process, the Forestry Commission usually holds a screening meeting first in the local area to decide whether the project has to go through EIA, and then mandatory scoping meetings are required to be held locally by the proposer as part of the information gathering process of preparing the Environmental Statement (ES). The ES has to include a description of the aspects of the environment likely to be significantly affected by the proposed project, and of the measures envisaged in order to avoid, reduce and if possible, remedy significant adverse effects. As well as the local consultation of the scoping meetings, the proposals themselves are required to be put out to local consultation (23). The RSPB plan for Broadwater Warren also includes the inevitable conservation grazing project, and I just wonder whether we shouldn’t be applying an EIA to these since there are now regulations that could cover that. The Environmental Impact Assessment (Agriculture) (England) (No. 2) Regulations 2006 exist to protect uncultivated and semi-natural land areas from damage caused by intensification of farming activities (24). The imposition of grazing where there was none before for many years would seem to fit this for semi-natural areas. The latter are defined in these EIA regulations largely by the plants and wildlife they support, with one of the categories being “scrub consisting of self-seeded wild shrubs and trees” (25). It would thus be interesting to see one of the imposed grazing projects such as at Ashdown Forest or Blacka Moor undergo this EIA process. I fear though that it is unlikely ever to happen, since Natural England is the body under the regulations that is tasked to carry out an initial screening and then give consent after an ES has been submitted. Would they ever screen, or fail to give consent when it would have been their advice in the first place to impose the grazing at those two locations? Conservation grazing is something that is often a threat in the background at Loxley and Wadsley Commons, originating it seems from those wedded to the management plan and who assert that it would be the only option if the tree clearance weren’t to take place. With the winters of felling and poisoning adding up now, more and more people around Loxley and Wadsley Commons are becoming disgusted at the poor quality of the work and the disastrous impact that it is having. Since this revulsion happens almost universally now wherever the efforts of the conservation industry on heathland are seen, it begs the question of why locally tailored EIA processes aren’t implemented as part of good practice. I got my own taste of this revulsion when I popped in to have a look at the first LNR recently declared in my home area (26). As soon as I arrived, I realised that this was one of the areas of derelict land that the council owned that had been cleared of machinery and rubbish in the mid 90’s with the aim of turning it into a nature reserve with public access. Railway Terrace LNR was thus originally an abandoned 5.4Ha railway sidings where ecosystem restoration had begun apace, the low fertility attracting first heather, then in succession brambles, broom and birch with willow in the damper areas. It looked like the council had initially tamed one area by turning it into amenity grassland, but then they put in a path, planted a few island copse of native (and non-native?) trees in the grassland and spread a few wildflower seeds around. An artificial pond has been created in a hollow with aquatic and marginal plants introduced, but from the size of the trees still standing in the heathland section, there had been little management in that area for some years. Except that there was abundant evidence that very many trees approaching maturity had just been coppiced or felled in advance of the LNR declaration, the trunks, boughs and brash being used to construct fascine-like walls either side of the main path in a silly attempt to contain people and stop them walking on the heath. My companion on the walk muttered darkly “Too much, too soon. It’s ghastly”. Railway Terrace LNR has much in common with the wildlife gardening that goes on in school grounds. But there was a time, during its period of abandonment, when the wild nature of ecosystem restoration held sway there. Its relatively small size – say in comparison to Loxley and Wadsley Commons - probably suggests that there should be discussions about a limit to the aspiration of leaving wild nature in charge, but it does seem harsh to subsume so much of it to the needs of what is just a heathland monoculture of only one species of heather and no other dwarf shrubs. On the other hand, Loxley and Wadsley Commons has infinitely more potential than just being a wildlife garden and it needs a new paradigm rather than the poverty of approach applied to it at the moment. Turner leaves aside the question of "Should we manage nature?" and instead asks "How well does (can) managing nature actually work?" This is the question that the Friends of Loxley and Wadsley Commons are rightly asking (2). The Countryside Management Service works county-wide in Hertfordshire, servicing the needs of the various District and Borough Councils. Its website shows that the three commons, and a fourth in Chorleywood Common, are grouped together in a project entitled Grazing on South Herts Commons (29). This is a plan to introduce fencing and grazing on these commons to restore heathland and acid grassland, and while it is not mentioned, it is more than likely that it is the Habitat Action Plan (HAP) for Heathlands in the Biodiversity Action Plan (BAP) for Hertfordshire that is the driver for these actions (30). The first “demanding condition” is usually the clearance of scrub and the felling of the often mature trees of secondary woodland (and see later) followed by “heavy disturbance and removal of accumulated organic layers” so that heather seed if there is any can germinate. The introduction of fencing and grazing is the next step to keep the cleared area open and to reduce fertility in soils that have often considerably changed from when they were heathland. Thus the lack of differentiation just seems like covering all eventualities to me since if the heath doesn’t reappear – as has happened at Loxley and Wadsley Commons (see above) – then they can still claim success under the target with the acid grassland that they have produced instead. With each commons, the CMS provide a map showing the proposed course of the fencing that they will undertake to allow introduction of conservation grazing – two of the four proposals provide alternate options for the fence line. Lest we haven’t got the point of the grazing, CMS throw in the bluster that the commoners may decide tomorrow to resume their grazing – which of course would create a real problem in securing permission for the fencing proposals on the statutory commons and anyway do away with the need for the grazing project. This low level of brain use is matched by the consultation that local people are being afforded by the CMS about what are probably all publicly owned spaces – Do you support the return of grazing animals? Do you support the fencing proposal? Which fencing option do you prefer at Chorleywood Common? You do not get a choice as to whether the trees are being cut down unless, of course, you want to provide a complaint about this in your own comments, except that the consultation is now closed. I have looked at the detail in each of the commons in turn, all of which are registered, one is a SSSI, and two are LNR, but the latter designations are immaterial here. I’ve checked the landscape cover, especially the woodland cover, and matched the fencing proposals to it. There is no felling licence currently in operation at Nomansland Common, in spite of the fact that the recent felling of 60 oaks there might be in breach of thresholds for felling regulations. Nor is there a felling licence at any of the other commons where John Thompson has seen “hundreds of healthy trees” felled. The consultation map for Nomansland Common from the CMS misrepresents the landscape cover of the commons, omitting an area of woodland to the W of Down Green Lane and immediately above Ferrers Lane that is marked as such in the National Inventory of Woodland and Trees, and which is also mapped as woodland accessible to the public under the Woods for People project of the Forestry Commission and Woodland Trust (17 and see Doorstep wildness - our nearness to the natural world). An ariel photograph of this woodland area matches with the Woods for People mapping, indicating a narrow opening of the woodland either side of a path that reaches up diagonally NE through the omitted woodland. There is also another small, triangular open space to the E of Down Green Lane and along Ferrers Lane at the SE edge of woodland. Are these two open spaces in and next to woodland the location of the heathland that CMS proclaims (31) “some of the best in south Hertfordshire”? Is it an oversight that CMS has used a map that omits woodland? Or is it convenient for them to create uncertainty in people’s minds about the extent of the tree felling that they may undertake in restoring such a desultory area of heath? Moreover, why does the proposed fencing enclose most of the woodland on the commons, and thus subject it to grazing pressure? Bricket Wood Common is a SSSI that has three Units of woodland, one of which is ancient (Muchetts Wood) and which lies outside of the registered commons area. Another Unit-type of the SSSI on the commons is dwarf shrub heath that is split into three small parcels, roughly in the mid level area of the commons, and representing about 7% of the commons. The openings in the woodland shown on an ariel photograph pretty much agree with the location of these three small heathland areas on the SSSI mapping, and yet the proposal from the CMS is a fence that encircles the whole of the middle of the commons, not only incorporating the heath patches but also the same area and more of woodland. Is this a strategy to degrade the woodland enclosed within the fence in the hope that more heathland will appear? While I wouldn’t normally uphold SSSI notification, doesn’t this cut across the features for which this site was designated? Would you be comfortable coming across a dairy long-horn cow as you walked through woodland? With so little heathland represented by these four commons, and probably with no great hope of much of an expansion, why is so much effort and expense being invested and with so much disruption caused? Doesn’t this again show how bankrupt is the dogmatic, target-led approach to nature conservation? Its not often that I have some good news to report, but this comes via The Herts Advertiser. In a victory for local residents over the stubborn orthodoxy of council officers, the proposal to fence off not just the open commons at Nomansland, but also the substantial area of woodland associated with it as well - and then graze the whole lot with cattle - has been thrown out at a meeting of the Joint Management Committee of the commons on 30 July (34). The plan never made much sense, even in the world of twisted logic of the conservation professionals. What this does show is that the complacency and unthinking orthodoxy of these people can be challenged effectively when local residents check through the plans and expose them for the nonsense that they often are. The article notes that there hasn't been the same resistance to the similar schemes proposed for commons in Bricket Wood and Colney Heath. The latter is perhaps understandable, since as I noted above, there is no map-able woodland there that would be at risk of damage from grazing. However, this is the case at Bricket Wood.